Credit: Martin Oeggerli, National Geographic. First, Chris Goforth is really excited about insect eggs. Her dissertation focuses on water bug eggs and she's excited by the feature in this month's National Geographic that focuses on these delicate items. It's a great opportunity for Goforth to introduce readers to one of the tools used in her research—the scanning microscope. As humans, we’re not likely to send out a food-sharing call to just anyone who happens to be within ear shot. If we’ve found something great, chances are we’re only interested in sharing with ‘socially important individuals’, people with whom we are closely associated. After all, if you do something nice for members of your immediate social group, it strengthens the group bond and should translate into some reciprocal assistance at a later time. Reminiscent of those cliques you experienced in high school, there is also a form of social rejection of non-members. If you’re not a part of the club, you aren’t invited to take part in the ‘members only’ benefits…whatever they may be. It turns out that in wild chimpanzees the same logic applies. Just another link to our primate cousins, it seems. 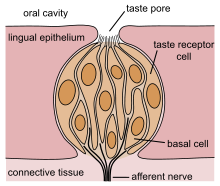 Anatomy of a taste bud. If you'd like a refresher on morality, Sarah Askew has posted the first part of a talk by Jonathan Haidt about a new analogy on morality based on taste. According to Haidt, there are "five key foundations of morality, parallel to the five kinds of taste receptors found on our tongues: care/harm, fairness/cheating, group loyalty and betrayal, authority and subversion, sanctity and degradation." So ... you are what you taste? My own experience as a woman blogger has not been easy. It can be difficult at times to juggle a full time job, family, and writing. I do it simply because it makes me happy. Because it's a chance to be connected to things that are important to me. Though not everyone has understood this, it's important to me, and I'm glad to have been included in such an esteemed list. There are a great many more writers in addition to the few named here. You're encouraged to spend the rest of your morning perusing their sites, and letting Martin know of anyone else who should be counted.